There is a lot of running scheduled on this trip. Distances in the itinerary are flexible. We will have vehicle support most of the time, and it will usually be possible to run shorter distances, or opt out of a run. Arrival in Santiago and connect on our flight to Calama. Upon arrival in Calama, we continue on a 1 ½ hour bus drive to San Pedro de Atacama (8,000'/2,450 m). The Atacama Desert is situated between the Andes Mountains and Pacific Ocean and stretches 600 miles (1,000 kilometers) from Peru's southern border into northern Chile. This region is extremely hyper-arid. It is an inhospitable, seemingly lifeless, sun drenched spot that is probably the driest place on Earth. Temperatures in the Atacama vary daily from 95°F down to 32°F. The Atacama is 10 to 15 million years old and 50 times more arid than California's Death Valley. There are places where rain has never been recorded. This natural environment on Earth poses some of the same challenges for human explorers as would a seemingly lifeless planet. NASA scientists and engineers selected this landscape to test the technology that will be used in places like the Moon or Mars - the Atacama is "the closest place to Mars." Today's flight: 2 hour flight from Santiago to Calama. Today's drive: 90 km (55 miles) from Calama to San Pedro de Atacama. Day on your own to relax, rest, recover and enjoy San Pedro de Atacama. Early breakfast followed by a short drive to the start of the Atacama Marathon in the upper part of the Valley of Death "Valle de la Muerte" at an elevation of approximately 9,190 feet (2,800 meters). The spectacular course includes all the best trails in San Pedro de Atacama. We run along the Cordillera de La Sal - a magnificently colored reddish clay and salt range. The course starts at the Valley of Death and descends to the Quitor Valley. From there it continues to the Valley of Silence, then the Valley of the Moon and the dramatic finish in the Kari Gorge, a narrow canyon formed by water erosion and surrounded by enormous salt walls. We end the race at the control gate of the Valley of the Moon, at approximately 8,530 feet (2,600 meters). Meals: Breakfast & afternoon grill buffet lunch by the pool. Today’s run: 26.2 miles (42 km). Today’s drive: Very short distances around San Pedro. A one hour drive takes us to "Hito Cajon" at the Bolivian border. The Eduardo Avaroa National Reserve is in the southwestern section of Bolivia, bordering Chile and Argentina. This Puna region ranges in altitude from 11,482 feet (3,500 meters) and extends above 16,400 feet (5,000 meters). Continue across the Bolivian altiplano to the hot springs in Laguna Salada and to the active geyser, “Sol de la Mañana”. From there to Laguna Colorada, a lake with a pinkish hue. This naturally occurring color results from algae and minerals in the lake, which is the main source of food for the thousands of pink flamingos. Three of the world’s six flamingo species  Chilean, James’ and Andean breed in this area. Today we do not have a scheduled run due to the sudden climb to high elevation. We will however have opportunities for acclimatization hikes along the drive. We continue our drive to our hotel in Ojo de Perdiz. Today’s run: No run scheduled. Acclimatization hikes to break the drive..
Today’s drive: About 7 hours with various stops in the altiplano. We continue north on the altiplano "high plain" where we will see llamas, wild herds of vicuñas, Andean geese and other wildlife. Today’s run: No run scheduled. Acclimatization hikes to break the drive. This morning we enter the impressive Salar de Uyuni, the salar is 4,700-square-miles of salt flats - the largest in the world. Some 40,000 years ago the area was part of Lake Minchin a gigantic prehistoric lake. When the lake dried it left behind two major salt deserts, the largest one - the Salar de Uyuni. The salt is completely white and the depth is about 20 feet. We drive to the start of the run, which will be on the salt flats and we finish on Incahuasi Island (12,010’/3,660 m) - a rocky outcrop in the middle of the vast white expanse of salt. Here you will see giant cacti covering the island creating one of the most surreal landscapes on earth. 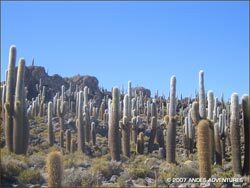 It is estimated that these cacti grows only about 1 centimeter per year. Some of the cacti reach up to 36 feet (11 meter) and are 1,200 years old. We continue to Uyuni and we fly to La Paz. In La Paz (12,000’/3,660 m), we will have views of the impressive summit of Illimani (21,260'), the highest mountain in the Cordillera Real range on the southeastern side of the city. Today’s run: Optional distances from 5 to 10 miles (8 to 16 km). Today’s drive: 96 miles about 2 ½hours. La Paz is the administrative capital of Bolivia. We will have a tour of the city’s colonial and historical sections. 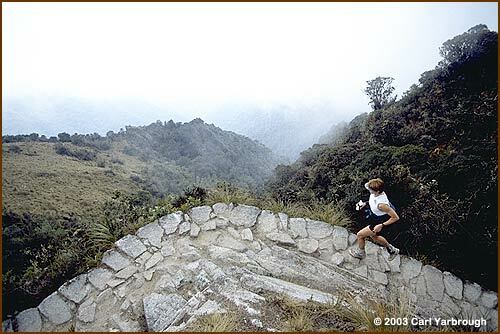 A run is scheduled in La Paz from Achocalla to Valley of the Moon. Today’s run: About 5 to 6 miles (8 to 10 km). This morning we visit Tiwanacu (also known as Tiahuanaco), one of the oldest cultures in South America. It is believed to be the origin of the Pre-Inca Civilization. It was one of the most advanced cultures at that time. The main structures are the Kalasasaya temple with construction details similar to Machu Picchu's Gate of the Sun, the Akapana pyramid; and the semi-underground temple. We travel in the highlands and continue along the eastern shore of the lake to the strait of Tiquina, which we cross by ferry and continue along the road overlooking the lake and arrive in Copacabana at about12,500'. Overnight: Hotel Rosario del Lago. Today’s run: Optional distances from 5 to 8 miles (8 to 13 km). This morning we take a private boat to the island section of Yumani and hike to our accommodations at La Estancia and get ready for the Island of the Sun Marathon around the island. You will have the option to run the Island of the Sun Marathon 26.2 mile course or a shorter run around the Island. We start our scenic run in Yumani and follow the upper mountain trail and descend to the Chinkana ruins in the northern part of the island, we turn south and continue our descend till we reach our aid station at Challapampa on the lake. We continue to Challa, passing villages, agricultural fields and beaches. The marathon continues to the other end of the island and completes the circuit around the island, returning to our accommodations at the Ecolodge. Overnight: Ecolodge La Estancia on the Island of the Sun in Lake Titicaca. Today’s run: 26.2 Marathon or an optional run of about 4 to 6 hours. Today’s boat ride: 1 hour to the Island of the Sun. After breakfast we descend to the lake to take our private boat to Copacabana. A short 15 minute drive to Kasani and across the border to Yunguyo - Perú. Continue overland to Puno (12,560'). Today’s run: None scheduled (optional runs on your own). Today’s boat ride: 1 hour to Copacabana. After breakfast, we leave from the hotel dock and travel by boat to the "floating islands" of the Uros people who build the famous "totora" reed boats. The Uros and other lakeside dwellers depend extensively on the totora reed. It is used to make fishing boats and homes as well as the famous floating islands of reed. This afternoon we transfer to the airport at Juliaca, visiting the ruins of Sillustani en route. Sillustani is in a beautiful setting on a barren, windswept peninsula about 15 miles from Puno. Here we'll view chullpas (pre-Columbian funeral towers) that date from the time of the Inca occupation of this region, around the 15th century. These towers were built by and for people of the Aymara-speaking Colla tribe. Sillustani's stone architecture is complex and different in many ways from Inca stonework. Arrival at the Lima airport and connect to your flight home. Today’s boat ride: Boat tour to the Uros Islands (Peru). *Single rooms are limited and not available on 2 nights. Please call for details. • Airport check-in and baggage assistance in Chile, Bolivia and Perú. • All airport departure taxes. • All airport transfers and ground transportation as scheduled on itinerary. • All meals included: Breakfast, Lunch and Dinner. Vegetarian meals can be accommodated (please request in advance). • All accommodations in Chile, Bolivia & Peru are in fine hotels. Based on double occupancy, rooms are shared by two people. 2 nights are in rustic accommodations and we may share more than 2 per room. • The services of professional tour guides. • Our local leaders and guides are knowledgeable about the language, customs, culture and history of their country. They are detail oriented and take great pleasure in sharing their insight and expertise. They help make sure everything runs as safely and smoothly as possible. • Transfers for independent arrival or departure, travel insurance (highly recommended) for which an application will be included with your confirmation, passport fees, excess baggage fees, Bolivian visa*, optional tips to trip leader, guides and local staff. All items of personal nature such as: personal gear, laundry, telephone calls, beverages, bottled water, etc. *U.S citizens need a visa to enter Bolivia. The cost is $160 and you need to apply through the Bolivian consulate or at Bolivian border (information will be sent). There are no fees or visas required to enter Chile and Perú. Note: Canadians are charged a one-time "Reciprocity fee" of $132, Australians pay US$95. This is paid upon landing at the Santiago International Airport. This is charged in reciprocity for the fee these countries charges Chileans; it is good for the life of the passport and there is no need to pay again for subsequent trips to Chile.